The Final San Pedro H. P. Lovecraft Film Festival® took place in San Pedro, CA April 29th to May 1st, 2016 at the Warner Grand Theatre and Grand Vision Annex. This was the final HPLFF in San Pedro, CA; click here for the official announcement. If you were there, we hope you had a great time! After seven festivals since 2010, the H.P. 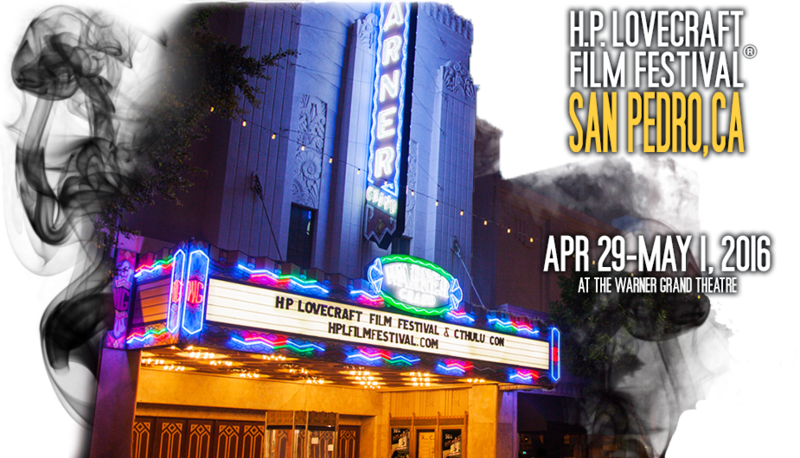 Lovecraft Film Festival® (HPLFF®) will not be returning to the Warner Grand Theatre in San Pedro, California. The epic final San Pedro event transpired from April 29 to May 1, 2016 over the auspicious Walpurgisnacht weekend, and featured author Joe Pulver, Sr. and a live cast accompaniment to the classic 1970 B-movie The Dunwich Horror. “We wish to thank all our volunteers, vendors, filmmakers, authors, artists, game masters, and especially our devoted audience and Kickstarter donors of the past six years for their passion, devotion, support, and love,” said San Pedro event organizer Aaron Vanek. The commission and creation of a Lovecraft-themed wall mural in San Pedro by noted underground artist Skinner. Screening a brand-new restored 35mm print of Berkeley Square (1933), presented by director Frank Lloyd’s grandson Christopher Gray. Famously reviewed by H. P. Lovecraft in a letter to R. H. Barlow, this film inspired Lovecraft’s classic tale The Shadow Out of Time. Presenting the Howie award (the HPLFF award for significant contributions to the genre of cosmic horror, weird tales, and Lovecraft cinema) to Michael Reaves, writer of The Real Ghostbusters cartoon episode “Collect Call of Cathulhu” and editor of the anthology Shadows Over Baker Street; and legendary filmmaker Roger Corman, who made the first cinematic adaptation of Lovecraft in The Haunted Palace starring Vincent Price (1963). Cody Goodfellow can be experienced this October as he again writes, acts, and hosts the Cthulhu Prayer Breakfast at the HPLFF in Portland and promotes his newest book, Rapture Of The Deep & Other Lovecraftian Tales. James Knouse of Lovecraft Wines (lovecraftwines.com) will continue to press the spirits, and is slated to vend at the Portland festival, and wherever there is a need for his unique brand of bottled madness. Miguel Rodriguez directs the terrifyingly successful Horrible Imaginings Film Festival™ in San Diego, which is currently the #11 best-reviewed film festival on FilmFreeway (hifilmfest.com). Aaron Vanek will continue to write and design role-playing games, scenarios, and larps based on the works of H.P. Lovecraft, and is planning a DVD release of his Lovecraftian movies, including the rare and newly remastered Return to Innsmouth (1999). Frank Woodward is in pre-production on new documentaries as well as his first feature film, Exit. He will also be working for French television as screenwriter for the Elements of Disaster series. These TV movies begin production in 2017. We encourage all of our San Pedro fans to attend the main H. P. Lovecraft Film Festival every October at the Hollywood Theatre in Portland, Oregon—taking place this October 7-9—and every even-numbered year in Providence, R.I. For more information please visit hplff.com. “H. 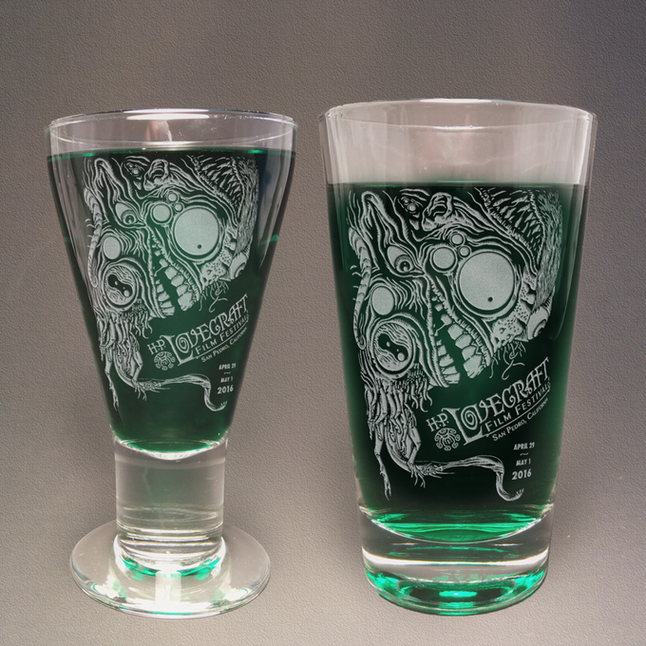 P. Lovecraft Film Festival” is a registered trademark of Lurker Films, Inc.
HPLFF San Pedro Store has swag available from the Fest. The San Pedro Festival 2016 is over. Our "most accursed rites of human blasphemy... called him for a moment" and then was gone. Rites that included the base lamentations of writers awed and horrified at our cosmic insignificance, artists creating new works while merchants sold strange artifacts. Friday was the twin hammers to the head of Black Mountain Side and The Mist. Walpurgisnacht Saturday had panels and a NEW play adaptation of The Colour Out of Space, and the psycho freakout of The Dunwich Horror Picture Show. Films traditional and expermiental from around the world were a tour de force. Sunday's Brucnh in fun was the perfect hangover cure, with sermons, songs, Ask Lovecraft and games including demo of the 7th Edition Call of Cthulhu. ia ia!! Hosted by LoveCraft Wines at Off the Vine across the street from the Warner Grand Theatre. The SpeakEasy will open at 3:30 PM April 29th and will feature LoveCraft Wines, readings, art, music with Marionette H.P. Lovecraft himself reading poetry! The theme: The Dunwich Horror. "It was in the township of San Pedro, in a large and mostly renovated art deco filmhouse set near the Waterfront, a half mile from the seashore and four and a half miles from Trump Golf Club, that Wilbur Whateley returned at 9:30 pm. on Saturday, the 30th of April, 2016. This date should be recalled because it is May Eve, which strange folks curiously observe under another name, Walpurgisnacht."